Cowpokes, Country Cows and Cowboys! 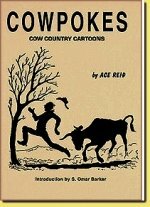 Cowpokes: Cow Country Cartoons, published by Ace Reid, 62 pages, $7.50. I love being surprised by a comic book or strip I’ve never read before. Take Ace Reid’s Cow-pokes cartoons, for instance. I’m no cowboy, but, I’ve known plenty over the years, living in Oklahoma, and I see some of them well-represented within Reid’s single-panel cartoons. Especially when tourists stop to ask a couple of them, hard at work fixing fence, “Hey, could you fellows tell us where we might see real cowboys?” (Why is it city folk have such a hard time recognizing the real thing?) Or, when another proudly says to his buddy, “Man, this is better’n being rich – jist owe everybody so much they gotta be nice to you.” Then there’s the panel showing a cowboy tangled in what MUST be a painful heap with his horse, among a bunch of rocks and cactus, exclaiming, “Dang it! I busted that new eight dollar rope!” Yep, them’s cowboy priorities. Besides the honest and realistic humor, Reid offers fans an art style like no other. His unique characters display a gaunt, yet rugged appearance. They look constantly hungry (as do the horses and cattle), haggard, worn out and played out. Yet, they’re obviously not too spent to get into tons of trouble. Whether it’s in a jeep perched precariously over a canyon, held by two spindly pieces of barbed wire after swerving to miss a skunk (“You shore missed him all right!”), or sitting atop a frightened horse with a wild boar at the other end of a rope (“Yep, Jake, you got yourself a hog – now what you gonna do?”), Reid’s cow-pokes convey the reality of cowboy life in an original way that’ll tickle your funny bone, even while they elicit your sympathy. There’s no feeling sorry for those who discover this treasure, though. Reid’s Cowpokes books are recommended for those who enjoy single panel gag strips, cowboy life, or just a good chuckle. Find them at online retailers and auctions, and at www.cowpokes.com .